Designed for environmental land-use planner Steve Graves and his wife, Paddy, a health professional, McCormick Woods was conceived by the Graves’ as an environmentally responsible housing development from inception through fruition, ultimately achieving Silver-level LEED certification in 2006. Our design services in those early stages of this eco-friendly development included Conceptual Site Design, Conceptual Building Design, and Schematic Building Design services. Our work for the Graves proceeded briskly, working successfully to meet a strict deadline for submitting to City of Capitola Design Review. After that—despite some initial trepidation on the part of City Council members about the merits of this first time green spec project in their area—things proceeded smoothly, due in equal measure to the obvious merits of the Project but no less due to support of the United States Green Building Council (USGBC), Monterey Chapter. After that things moved swiftly, with permits reportedly taking only some six months to procure, and construction of all the homes in only scant eight months after that. 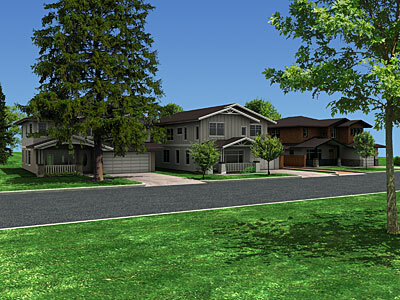 Captured in those earliest design iterations when McCormick Woods was “on our boards” were the qualities that would eventually garner the coveted LEED rating, including consolidated unit deployment on the site to limit built impacts such as impervious surfacing, and compact, economical building forms to optimize surface-to-volume massing ratios, thereby reducing the heating and cooling requirements of the new homes. More specifically, present from a LEED standpoint were intentionality toward Sustainable Sites Credit 5.2: Site Development to Maximize Open Space, Materials & Resources Credit 4.1: Recycled Content, Indoor Environmental Quality Credit 7.1: Thermal Comfort Design, and Indoor Environmental Quality Credit 8.2: Daylight & Views. 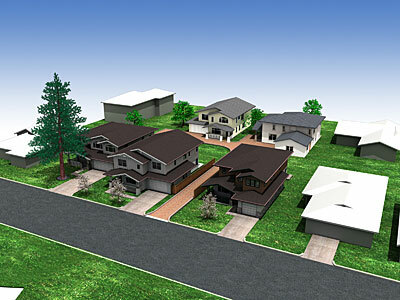 Even in these early design iterations the Project evinced the superior architectural aesthetic, which would result in this being one of the most desirable neighborhood clusters in the City of Capitola.